AWS Glue is a fully managed extract, transform, and load (ETL) service that makes it easy to prepare and load data for analytics. AWS Glue uses connections to access certain types of source and target data stores, as described in the AWS Glue documentation. 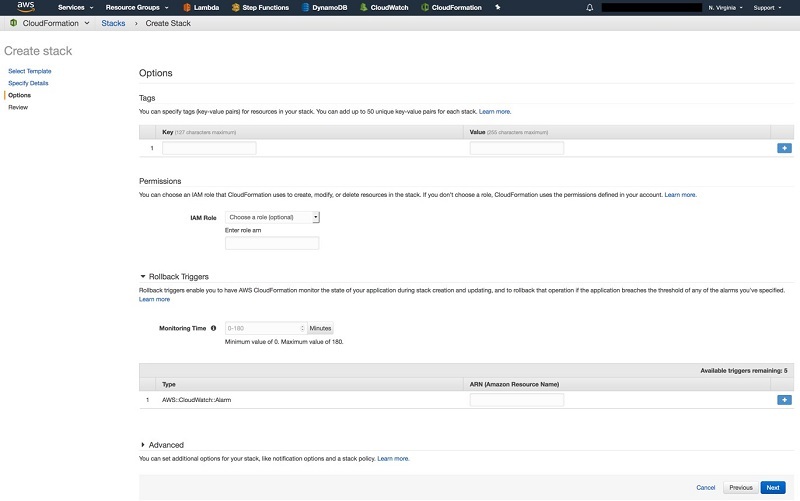 By default, you can use AWS Glue to create connections to data stores in the same AWS account and AWS Region as the one where you have AWS Glue resources. In this blog post, we describe how to access data stores in an account or AWS Region different from the one where you have AWS Glue resources. 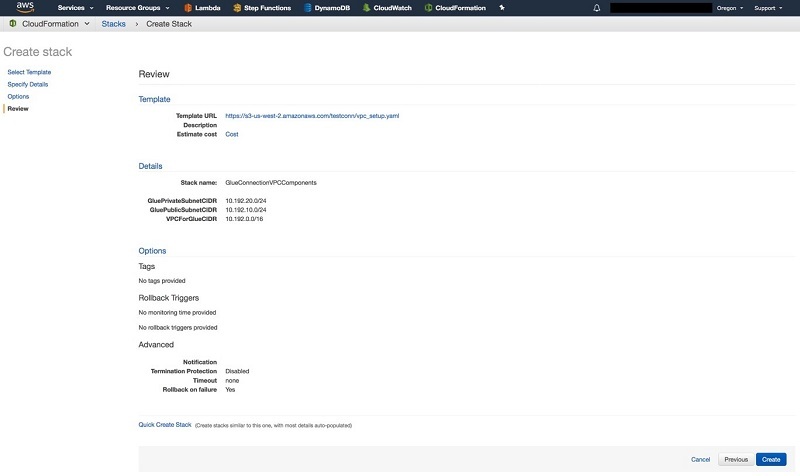 AWS Glue uses a connection to crawl and catalog a data store’s metadata in the AWS Glue Data Catalog, as the documentation describes. AWS Glue ETL jobs also use connections to connect to source and target data stores. AWS Glue supports connections to Amazon Redshift, Amazon RDS, and JDBC data stores. A connection contains the properties needed by AWS Glue to access a data store. These properties might include connection information such as user name and password, data store subnet IDs, and security groups. 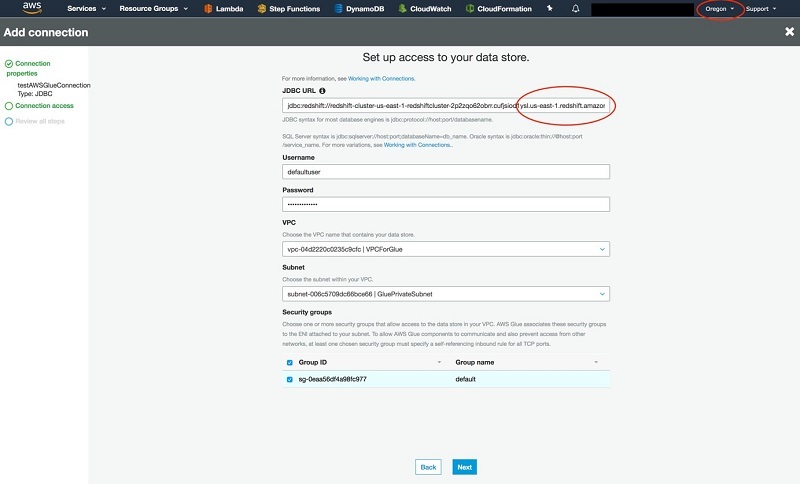 If the data store is located inside an Amazon VPC, AWS Glue uses the VPC subnet ID and security group ID connection properties to set up elastic network interfaces in the VPC containing the data store. Doing this enables ETL jobs and crawlers to connect securely to the data store in the VPC. AWS Glue can create this elastic network interface setup if the VPC containing the data store is in the same account and AWS Region as the AWS Glue resources. The security groups specified in a connection’s properties are applied on each of the network interfaces. The security group rules and network ACLs associated with the subnet control network traffic through the subnet. Correct rules for allowing outbound traffic through the subnet ensure that AWS Glue can establish network connectivity with all subnets in the VPC containing the data store, and therefore access the source or target data store. VPC components can be interlinked only if they are present in the same AWS Region. Therefore, AWS Glue cannot create the elastic network interfaces inside a VPC in another region. 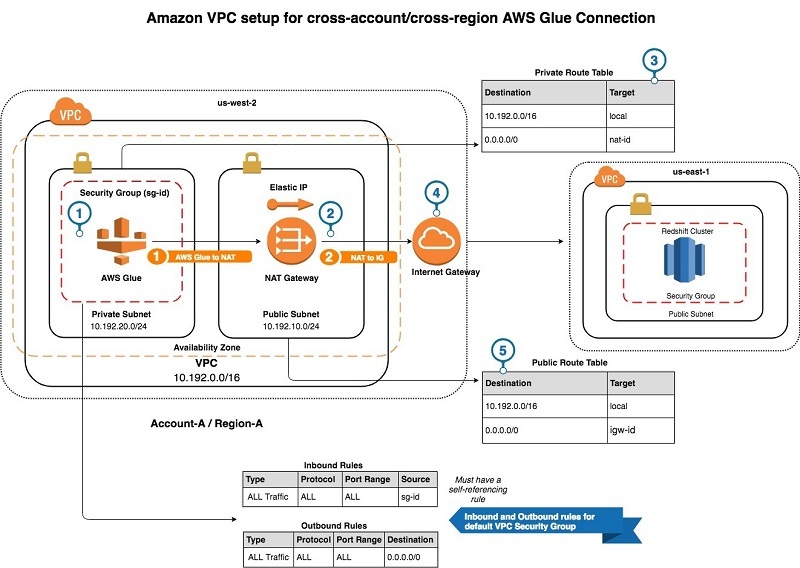 If the VPC containing the data store is in another region, you have to add the network routes and create additional network interfaces which allow network interfaces set up by AWS Glue to establish network connectivity with the data store. In this blog post, we describe how to configure the networking routes and interfaces to give AWS Glue access to a data store in an AWS Region different from the one with your AWS Glue resources. In our example, we connect AWS Glue, located in Region A, to an Amazon Redshift data warehouse located in Region B. Note: The examples here assume that the Amazon Redshift cluster is in a different AWS Region, but belongs to the same account. The same setup and instructions are also valid for an Amazon Redshift cluster in a different account. AWS Glue requires a VPC with networking routes to the data stores to which it connects. In our solution, the security groups and route tables are configured to enable elastic network interfaces set up by AWS Glue in a private subnet to reach the internet or connect to data stores outside the VPC. The following diagram shows the necessary components and the network traffic flow. AWS Glue resources in a private subnet in Region A. A NAT gateway with an Elastic IP address attached to it in a public subnet in Region A. A private route table containing a route allowing outbound network traffic from the private subnet to pass through the NAT gateway. An internet gateway in Region A. A public route table with a route allowing outbound network traffic from the public subnet to pass through the internet gateway. Note: We must update the default security group of the VPC to include a self-referencing inbound rule and an outbound rule to allow all traffic from all ports. Later in the example, we attach this security group to an AWS Glue connection to let network interfaces set up by AWS Glue communicate with each other within a private subnet. Outbound network traffic from AWS Glue resources in the private subnet to any destination or data store outside the private subnet is routed through the NAT gateway. The NAT gateway is present in a public subnet and has an associated Elastic IP address. It forwards network traffic from AWS Glue resources to internet by using an internet gateway. When AWS Glue tries to establish a connection with a data store outside of the private subnet, the incoming network traffic on the data store side appears to come from the NAT Gateway. On the data store side, you allow the data store or its security group to accept incoming network traffic from the Elastic IP address attached to the NAT gateway. This is shown in the section “Allow Amazon Redshift to accept network traffic from AWS Glue,” following. Note: In this example, we create the AWS Glue resources and connection in the us-west-2 Region. You can change this to the AWS Region where you have your AWS Glue connection and resources. You are directed to the AWS CloudFormation console, with the stack name and URL template fields pre-filled. Use the default IP ranges and choose Next. Skip this step and choose Next. Wait for stack creation to complete. After completion, all the VPC components and necessary setup required are created. Navigate to the VPC console and copy the Elastic IP address for the newly created NAT. Note: This IP address is used for outbound network flow from AWS Glue resources and so should be whitelisted on the data store side. For more detail, see “Allow Amazon Redshift to accept network traffic from AWS Glue,” following. Before creating and testing an AWS Glue connection to your data store, you need an IAM role that lets AWS Glue access the VPC components that you just created. For this example, we create a role called TestAWSGlueConnectionIAMRole with a managed IAM policy AWSGlueServiceRole attached to it. 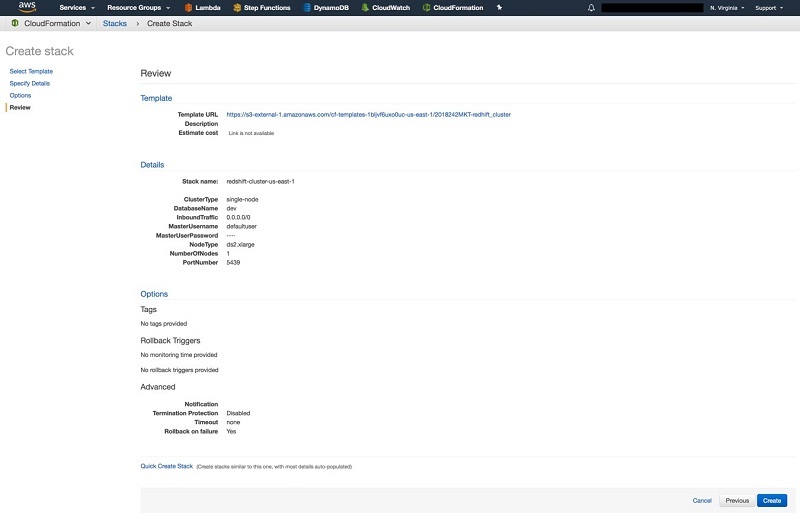 Choose the Roles tab from the AWS Identity and Access Management (IAM) console. 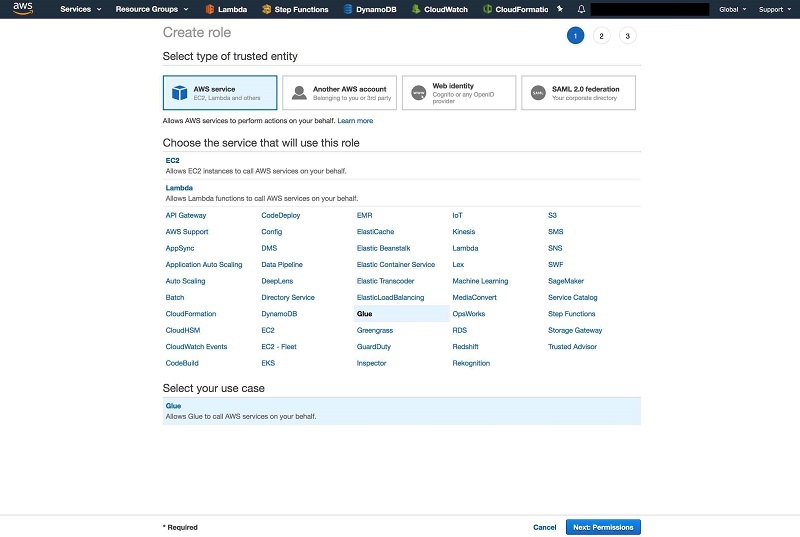 Choose Create role and select AWS Glue as a trusted entity. Attach an IAM policy to the role that allows AWS Glue to access the VPC components. 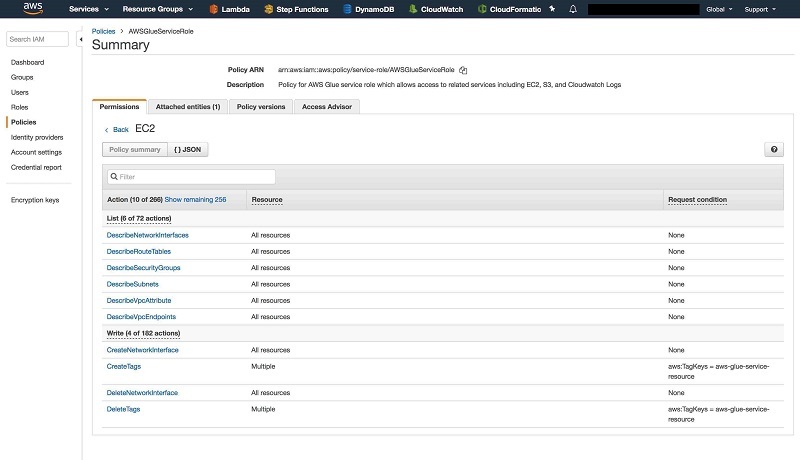 In this example, we are using the default AWSGlueServiceRole policy, which contains all the required permissions for the setup. We name the role TestAWSGlueConnectionRole. Note: The default GlueServiceRole policy that we attached to our custom role TestAWSGlueConnectionIAMRole has permissions for accessing VPC components. If you are using a custom policy instead of the default one, it should also contain the same permissions to be able to access VPC components. 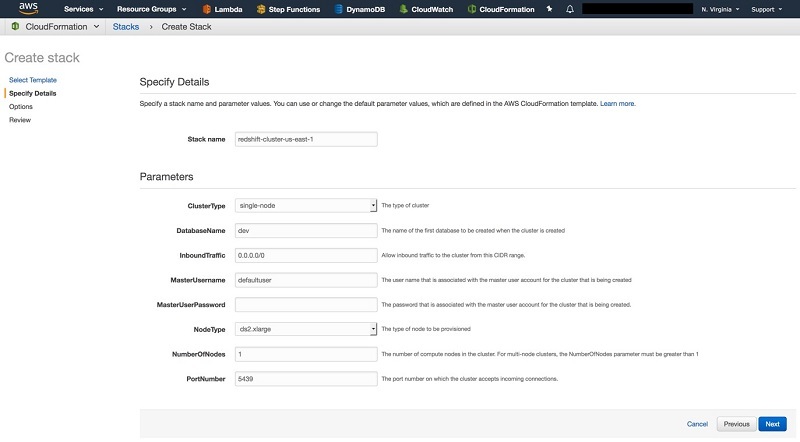 Navigate to the CloudFormation console in region us-east-1 and create a new stack using this CloudFormation template, described in the documentation. It must be 8–64 characters in length. It must contain at least one uppercase letter, one lowercase letter, and one number. It can use any printable ASCII characters (ASCII code 33–126) except ‘ (single quote), ” (double quote), :, \, /, @, or space. Choose Next and proceed with the stack creation. Review the configuration and choose Create. Wait for stack creation to complete, which can take a few minutes. 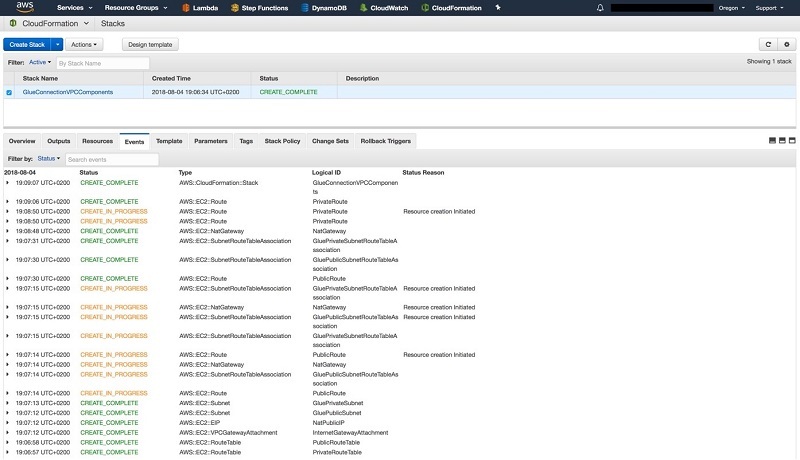 Navigate to the Amazon Redshift console and choose the cluster name to see the cluster properties. Note the JDBC URL for the cluster and the attached security group for later use. Note: We created a sample Amazon Redshift cluster in a public subnet present inside a VPC in Region B. 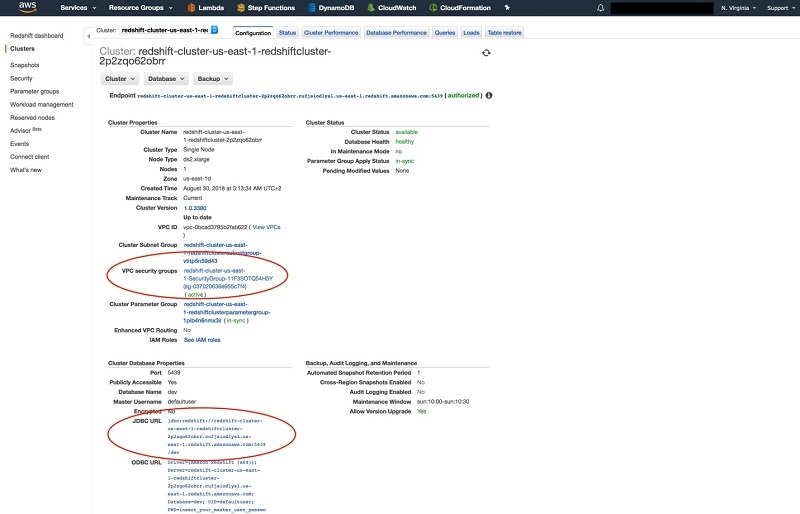 We recommend that you follow the best practices for increased security and availability while setting up a new Amazon Redshift cluster, as shown in our samples on GitHub. Choose Add Connection under the Connections tab in AWS Glue console. The AWS Region in which we are creating this connection is the same as for our VPC setup, that is US Oregon (us-west-2). Choose a JDBC connection type. You can choose to enforce JDBC SSL or not, depending on the configuration for your data store. Add the connection-specific configuration. Note the URL for our Amazon Redshift cluster. It shows that the Amazon Redshift cluster is present in us-east-1. Note: We use the VPC (VPCForGlue) and the private subnet (GluePrivateSubnet) we created for this connection. For security groups, we use the default security group for the VPC. This security group has a self-referencing inbound rule and an outbound rule that allows all traffic. Review configuration and choose Finish. The AWS Glue console should now show that the connection was created successfully. Note: Completing this step just means that an AWS Glue connection was created. It doesn’t guarantee that AWS Glue can actually connect to your data store. Before we test the connection, we also need to allow Amazon Redshift to accept network traffic coming from AWS Glue. The Amazon Redshift cluster in a different AWS Region (us-east-1) from AWS Glue must allow incoming network traffic from AWS Glue. For this, we update the security group attached to the Amazon Redshift cluster, and whitelist the Elastic IP address attached to the NAT gateway for the AWS Glue VPC. As a best practice, before you use a data store connection in an ETL job, choose Test connection. 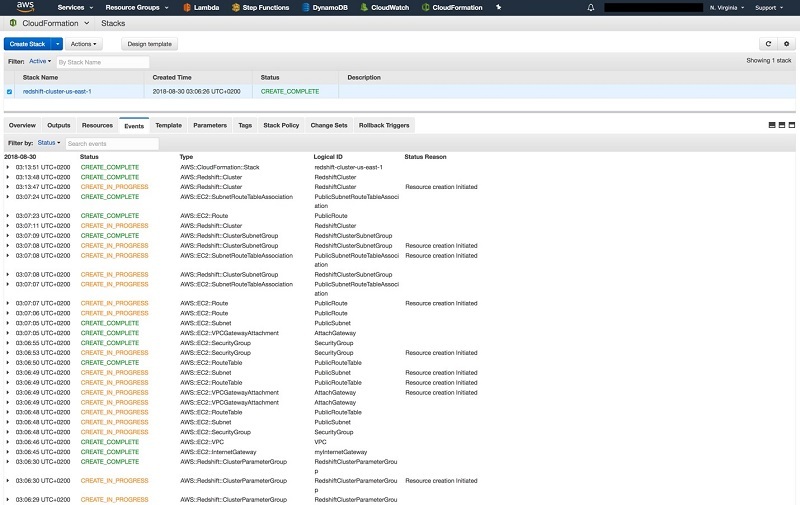 AWS Glue uses the parameters in your connection to confirm that it can access your data store and reports back any errors. Select the connection TestAWSGlueConnection that we just created and choose Test Connection. Select the TestAWSGlueConnectionIAMRole that we created for allowing AWS Glue resources to access VPC components. 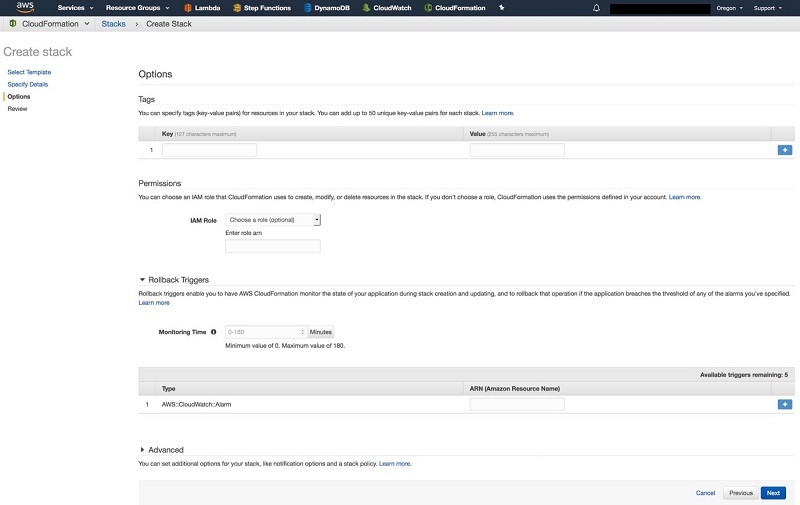 By creating a VPC setup similar to the one we describe, you can let AWS Glue connect to a data store in a different account or AWS Region. By doing this, you establish network connectivity between AWS Glue resources and your data store. You can now use this AWS Glue connection in ETL jobs and AWS Glue crawlers to connect with the data store. If you have questions or suggestions, please leave a comment following. If you found this post helpful, be sure to check out Connecting to and running ETL jobs across multiple VPCs using a dedicated AWS Glue VPC, and How to access and analyze on-premises data stores using AWS Glue. Pankaj Malhotra is a Software Development Engineer at Amazon Web Services. He enjoys solving problems related to cloud infrastructure and distributed systems. He specializes in developing multi-regional, resilient services using serverless technologies.